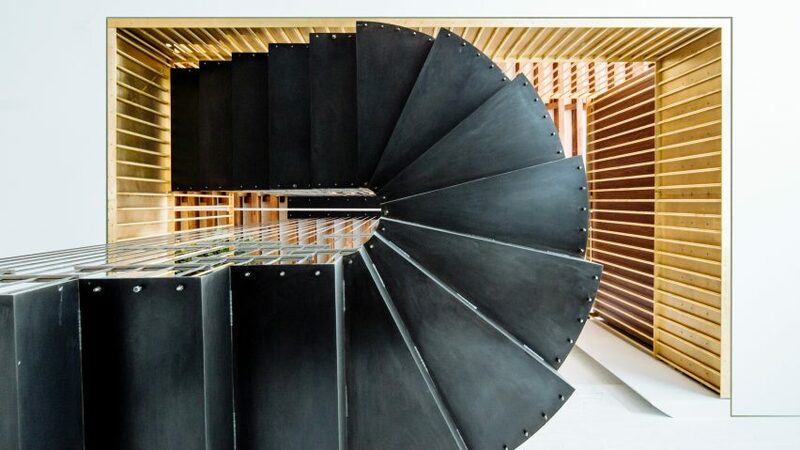 New York architecture studio Dash Marshall has turned two Tribeca residences into one home connected by a hanging, blackened steel spiral staircase. Raft Loft combines two single-storey apartments on the ground and first floor of an industrial building in the Lower Manhattan neighbourhood. Dash Marshall renovated, reconfigured and merged the two existing residences to create one big home for a growing family. A hole in the upper floor makes way for the new staircase, which connects a living area, small kitchen and dining room on the lower level with the main kitchen and dining room, and two bedrooms on the storey above. "We renovated the entirety of the ground floor, executed limited interventions to the second floor, and inserted a new staircase to connect the two spaces with a series of intermediate levels," said Dash Marshall. As a prominent element of Dash Marshall's project, the staircase comprises a mix of materials and two distinct elements. Brickwork forms the lower half, with its sides painted white to match the finish of the residence's existing walls. The steps are distinguished by pink paint and accompanied by a brass handrail. The blackened steel structure extends out in a spiral from the top of brickwork portion, twisting up to meet the first floor at the top. It is held up by delicate stainless steel slats that are suspended from the ceiling. These supports form a cage-like structure around the stairway, while further protection is provided by a brass banister that wraps around the void on the first floor. Dash Marshall's other main intervention is a raised wooden platform, built in the middle ground floor to break the long and thin plan into three distinct areas. A living area is placed on one side of the platform at the front of the residence, where two large windows bring in plenty of natural light. Deep and dark wooden frames create nooks for reading. Plants in terracotta pots of various sizes are arranged across the floor and on top of the wooden console, informing the pink and green tones of the space's large rug and sofa. Steps lead from here to the raised level in the centre of the floor, which is occupied by a dining table. The platform houses a small kitchenette and wine rack, which the studio says is "just enough infrastructure for a game of cards or a round of drinks". These facilities are built into a cube that houses a bathroom, accessed by a pair of wooden doors. Inside, the walls and floors are lined with speckled tiles and the ceiling curves up around light fittings. "Ceilings in the bathroom and powder room are designed as abstracted cloud formations," said the studio. On the outside, a large wooden door can be pulled out from the middle of this volume to create a private area at the rear for guests. When not in use by visitors, this portion of the floor provides the residents with a study and reading area, featuring built-in wooden bookshelves with a ladder to access the highest levels. Sliding translucent glass doors open into a piano room topped by a slanted glazed roof. A large red rug and plenty of plants add touches of colour against the white brickwork walls. The firm chose a more stripped-back material palette for the first floor, complementing the existing wooden ceiling beams and columns with dark wood flooring and white walls. Built in white cabinetry runs along the rear wall of the kitchen facing a central island with a concrete top. A dining area is placed around the corner near to the windows. Raft Loft is the second project we've featured that merges two existing residences in Tribeca into one home. New York firm Raad Studio designed the other, using a central arched wall as a focal point. Other renovation projects that have recently completed in the trendy neighbourhood include a loft with exposed steel pillars, a white-walled duplex designed around storage by Space4Architecture, and home topped with a glazed angular rooftop unit. Photography is by Mark Wickens.